Question:1.why did Gopal and the other guest stay at the palace guest house at night ? Answers: 1. One day there was a great celebration in the palace; which continued late into the night. So Gopal and the other guests stay at the Palace guest house at night. 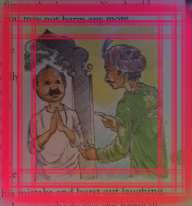 Question:2.Why did the barber Put the blame On the face the Maharaja had seen first in the morning? Answers: 2. While trimming the Maharaja the barbers hand slipped and the razor nicked one of the Maharaja fingers to save himself from pool, as the barber was quick - witted, he put the Blame On the face the Maharaja had seen first in the morning. Question:3.How was than Gopal' answer to the Maharaja? Answers:3. Gopal's answer to the Maharaja was quick-witted. Question:4.What did the Maharaja realise when he heard Gopal's sensor? What does this tell you about the Maharaja? Answers: 4. The Maharaja realised his mistake and burst out laughing. From this we come to know that Maharaja was a kind hearted man and believed in regions. Question:1. Why did the old lady come to see Gopal? Answers: 1.The old lady wanted Gopal to write a letter for her son who stayed ten miles away from her. So she came to him. Question:2.Gopal did not want to write the letter. What excuse did he make? ? Answers: 2.Gopal told the old lady that he was in intense pain. So he would not be able to write the letter. As he has very bad handwriting. Gopal will have to go a long with the letter to read it. As his legs were paining he thought it better not to write the letter. So that the confusion of reading is avoided. Question:3. Was the old lady bad tempered? Answers: 3. The old lady was of good nature. She forgave Gopal and laughed. Question:1. Gopal was not a doctor, yet the Maharaja asked him to select the rial physician. Why.? Answers: 1. Maharaja loved and trusted Gopal because he was wise and can solve any problem wisely. So the Maharaja requested Gopal to help him. Question:2.What extra question did Gopal demand? Was this a reasonable qualification? Answers: 2. Gopal wanted to know how many patient died under their treatment. The physician; who have killed more than thousand patient will be eligible to the post. No, this is not a reasonable question because Gopal wanted to select a good physician , under whose treatment very less people died. Question:3.Why was one of the physician trying to leave? Answers: 3. One physician was about to leave because he was honest and said he has cured most of his patients and only five of them died out of 35000 patients; which was far less than the required number. Question:4. Was Gopal's choice of the royal physician correct? why do you think so? Answers: 4.Yes, Gopal's choice of the royal physician was correct. The physician who had less number of unsuccessful patients. He treated 35000 patients and only 5 of them died. The doctor who spoke last was a good physician because under his treatment less number of people losses their lives.